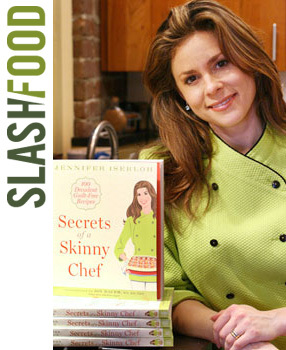 In my interviews last week with Slashfood’s Nicki Gostin as well as on Booking Mama, I talked about the philosophy behind Skinny Chef, touching on what makes my cookbook different from the million other diet cookbooks out there. As a restaurant-trained cook who somehow makes food that isn’t drenched in oil, butter or any of those other fattening things, I pointed out that flavor and “tastiness” is at the core of every recipe that I dream up. As to what makes me and my book different, “a lot of the healthy cookbooks out there are written by authors who don’t necessarily have my food background.” Having worked in both restaurant kitchens as well as in private homes, I always strive to embed the rich flavors typically associated with restaurant foods into healthier, home-made versions of America’s favorite comfort foods. Booking Mama also loved all the nutritional advice that I gave through the book (especially the Skinny Secrets) – and asked if the nutritional sections were harder to write than the rest of the cookbook. “(While) I’m not a nutritionist (…), I’ve worked for years with healthy eating publications as well as registered dietitians, so the nutrition part comes naturally. My other goal with the book was to include foods that have a super-charged nutritional profile, so that people are not only eating delicious meals but including things in their diet that the body needs. Look out for the super skinny foods like spinach, broccoli, ground turkey, and ground flax.